What Types of Cancer Are Caused by Smoking? When we think of smoking-related cancers, lung cancer is often our first thought. But there are many other smoking-related cancers. Overall, smoking is either the direct cause or a contributing factor in 30 percent of cancers. Finally, some cancers do not appear to be linked to smoking, but may grow more rapidly or spread earlier if a person smokes. Let's take a look at some of these cancers. It's important to note that we don't really know the causes of cancer, but rather look at risk factors for developing a cancer. Most of the time cancer is multifactorial, meaning that several factors may work together to either increase or decrease the risk of cancer developing. Just as we know that lung cancer occurs in non-smokers, and people who have smoked heavily may not get lung cancer, there are other factors which play a role in either raising or reducing risk. There are several cancers which have been fairly conclusively linked to smoking. For many of these, smoking is the leading risk factor for the disease. Lung cancer as stated above is the best-known smoking-related cancer, with smoking responsible for 80 to 90 percent of lung cancers. Smoking is the cause of bladder cancer in 50 percent of men and 30 percent of women. People who smoke have a 5-fold increased chance of developing bladder cancer. Smoking is thought to be the cause of about 30 percent of pancreatic cancers, and people who smoke are 2 to 3 times more likely to develop pancreatic cancer. Smoking can cause cancer of the mouth, tongue, throat, nasal cavities, and sinuses. Tobacco use is considered to be responsible for 85 percent of head and neck cancers. Smoking roughly doubles the risk of developing esophageal cancer. Smoking is considered responsible for about 20 percent of kidney cancers. The risk of stomach cancer in smokers is twice that of non-smokers. Smoking increases the risk of developing colon cancer and is considered to be responsible for 12 percent of fatal colon and rectal cancers. Smoking is correlated with an increased risk of developing acute myelogenous leukemia and is considered responsible for approximately 25 percent of cases. In 2010, the International Association for Cancer Research added ovarian cancer to the list of cancers caused by smoking. In one study, women who smoked for 25 years or more were twice as likely to develop ovarian cancer as women who had never smoked. Some cancers have not been linked directly to smoking, but smoking in some form or at some time or in combination with another factor may show an increased risk. It hasn’t been shown conclusively that smoking increases the risk of breast cancer, but studies are beginning to suggest a link. 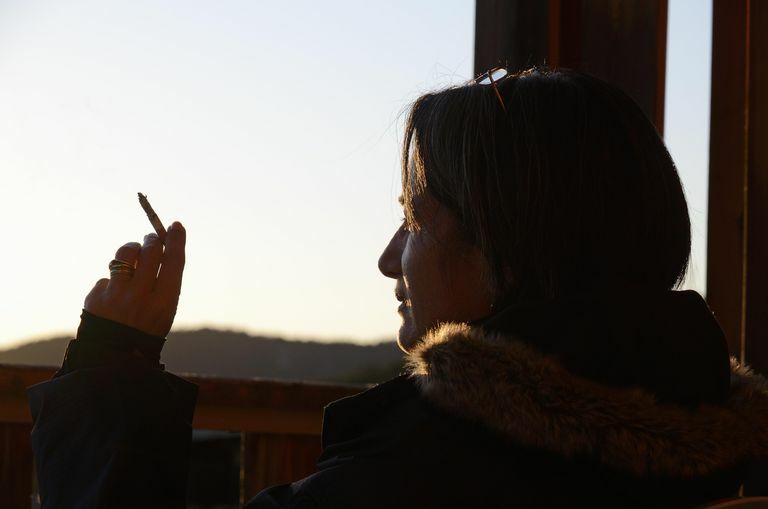 Women who smoke as teenagers appear to be more likely to develop pre-menopausal breast cancer and aggressive forms of breast cancer are more common in current and former smokers. As with breast cancer, a connection between prostate cancer and smoking hasn’t been proven conclusively. Yet, a 2010 review looking at 24 studies, suggests that smoking increases both the likelihood that a man will develop prostate cancer and the risk of death in men who have been diagnosed. Cigarette smoking probably increases the risk of primary liver cancer. Even if smoking does not appear to directly cause (or be a risk factor for) the development of cancer, it can still be dangerous in the sense of increasing the risk that a cancer will grow or spread. While smoking may not cause cervical cancer directly, it appears to accelerate the damage to cervical tissues caused by human papillomavirus (HPV), the primary cause of cervical cancer. Smoking appears to triple the risk of one form of skin cancer, squamous cell carcinoma. We heard people remark that "it's too late to quit" after being diagnosed with cancer. This is simply not true, and it can make a difference anytime to quit. For people who have cancer, the survival rate may be lower in people who smoke, depending on the cancer. Smoking during radiation therapy appears to make the treatment less effective, and may also increase the risk of side effects. Likewise, smoking during chemotherapy may increase the side effects related to these drugs, and also with some tumors, may be less effective. Even the newer targeted therapies for cancer, such as Tarceva (erlotinib) appear to be less effective in people who smoke. Take a moment to learn about 10 reasons to quit smoking after a diagnosis of cancer. Smoking is not only linked to lung cancer, but to several other cancers as well. In addition, smoking after a diagnosis of cancer can reduce your response to treatment and lower your survival. Centers for Disease Control and Prevention. Tobacco-Related Mortality. Updated 12/01/16. National Cancer Institute. Harms of Cigarette Smoking and Health Benefits of Quitting. Updated 12/03/14. National Cancer Institute. Head and Neck Cancers. Updated 03/29/17.